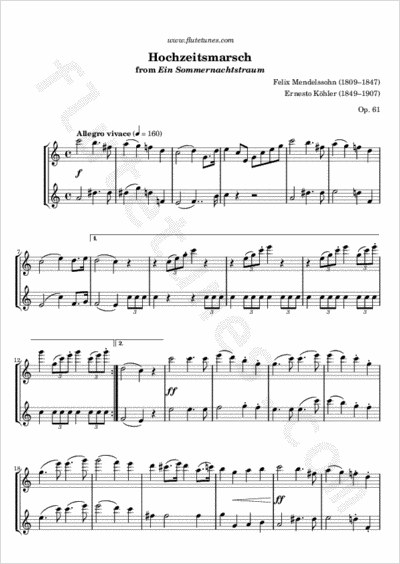 This is certainly the best-known of the pieces from the suite of incidental music for Shakespeare's play A Midsummer Night's Dream, written by Mendelssohn in 1842. It is one of the most frequently used wedding marches, generally being played on a church pipe organ. At weddings in many English-speaking countries, this piece is commonly used as a recessional, though frequently stripped of its episodes in this context. It is frequently teamed with the “Bridal Chorus” from Richard Wagner's opera Lohengrin, or with Jeremiah Clarke's “Prince of Denmark's March”, both of which are often played for the entry of the bride. The piece apparently became popular at weddings when it was selected by Victoria, The Princess Royal for her marriage to Prince Frederick William of Prussia in 1858.